Speaking in Yerevan’s France Square on Tuesday, leader of Armenia’s Civil Contract opposition party and lawmaker Nikol Pashinyan stated that he is "launching a velvet (revolution), a peaceful people’s revolution. ", TASS reported. "A revolutionary situation is brewing across the country. 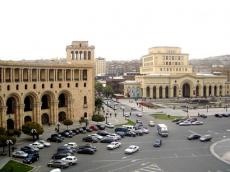 Demonstrators are blocking streets and transnational highways in the cities of Gyumri, Ijevan, Vanadzor, Kapan and Metsamor. People are not going to work, mass strikes have begun," he said. The Armenian parliament is holding a special meeting where the country’s new prime minister is due to be elected. The only candidate is former Armenian President Serzh Sargsyan. He is currently answering lawmakers’ questions. The radical opposition is holding a mass march, all downtown streets in the capital city have been paralyzed.